Retexture of keungkeung's Blanket Scarf in a more muted style. Includes 20 completely new textures! This is a continuation of KeungKeung's excellent blanket scarf mod. All credit goes to KeungKeung, and a big thank you for letting me repackage this mod with my own textures. Also big thanks to Cyphe who weighted the brooch mesh for me! 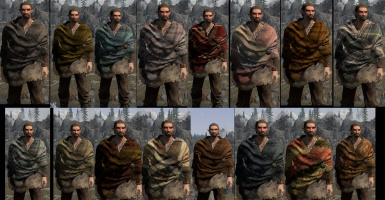 This mod is a standalone download, that adds 20 new blanket scarves. Only one remains from KeungKeung's original mod. These were primarily lighted for Classic, so it is possible that they might show up a little dark on SE. It is quite easy to lighten up the textures in GIMP or PHOTOSHOP, so that's an option. All scarves have recipes with easily obtainable components. The base for each scarf is 4 Linen Wraps, with more colorful options needing mountain flowers, hanging moss, charcoal, and more. The blankets can be worn over any clothing or armor. If you want these distributed for NPC's, check out Sokkvabekk's mod.